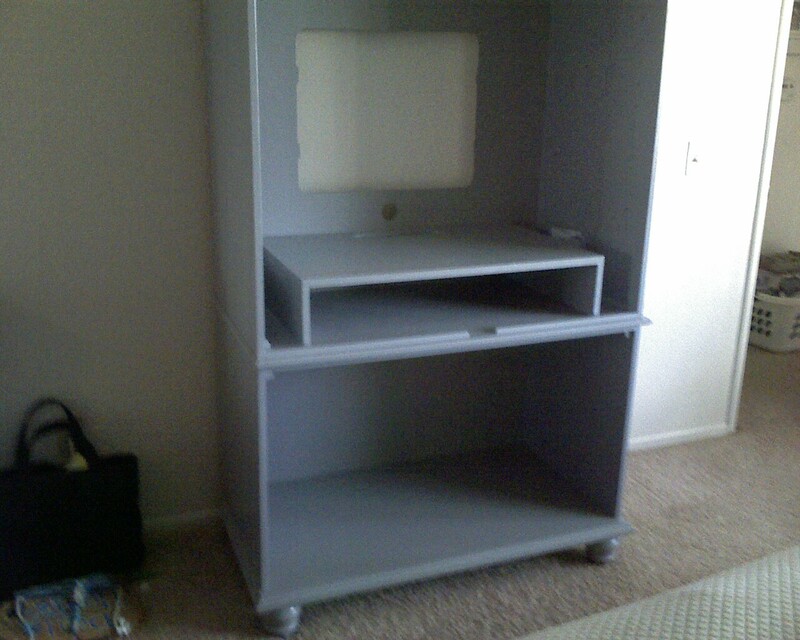 I've always wanted my very own Craft Armoire. Well really, I've always wanted my very own craft room. But I'll settle for an amoire given that I live in a tiny apartment. About a year ago, I (finally!!!) upgraded my BIG BOX TV to a Samsung Flat Screen TV like the one seen here . Oh, how I love a light, slim, easy to carry (by myself) TV. This TV being wider than the old big box, didn't fit into my TV armoire. So what to do with the armoire? It made it's way into my bedroom, with no TV to fill in it (I don't believe in TVs being in the bedroom) I started sticking arts and crafts supplies in it. Otherwise, my nifty supplies would be inconveniently stored in the garage, which is very inconveniently not attached to my apartment. I've been stuffing supplies in it, with not much of a rhyme or reason, and there's tons of wasted space. So it's time for it to have a make-over and be converted into an official Craft Armoire. ﻿It will have shelves, plastic bins, a peg board on the back of the doors for storing more supplies, drawers for scrapbook paper, baskets, ribbon spools, oh the possibilities! Just take a look at my inspiration board here! But first things first. It needed a paint job. And as per my previous post seen here, I selected a warm, gray color in a semi-gloss, Laura Ashley Home Mountain Pass. 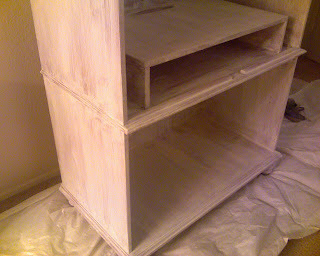 Now, I've never painted furniture before so this was sure to be an adventure from the get-go. I googled away and did some research until deciding on following the following method. First, of course, the prep work. Removed all the doors, shelves and hardware. I sanded everything lightly. Then applied 2 coats of oil-based Kilz Stainblock Primer Original . A good brush is needed here to have good results. More on that a bit later. I learned a BIG lesson here! Next time I'll apply only one coat AND I will get low or no VOC primer!! Wow, wowee! I thought I picked up low VOC which was very important to me because this armoire is hideously heavy and sitting in my bedroom, remember? 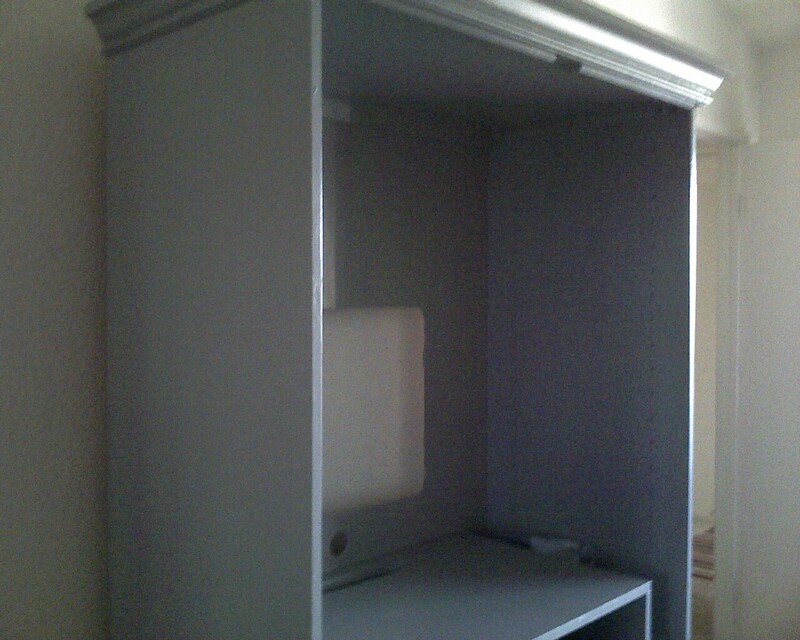 There's no way I was getting this armoire downstairs to the garage and back up to my bedroom just to paint it. So, paint in my bedroom it is. Much to my surprise, the primer stenched up my little apartment. Luckily, the smell was contained by closing the door. Unluckily, I wasn't going to be able to paint over the primer for days. Yup. I slept on the couch for 4 days. The primer did dry quick, though, and quick is always nice. Nothing like some instant gratification. Next, the paint. I applied two thin coats of Laura Ashley Interior Semi-Gloss Latex Paint in Mountain Pass . Mmmm...the smell of fresh paint. It makes everything feel new, fresh and mine. And it covers the smell of that primer like a charm. Whew! I was starting to walk around looking a little tipsy. Wow! What a difference paint can make! Take a look. I still need to reassemble the doors, add the shelves and attach hardware. But I haven't quite had the time...single mom, full time job, get the drift?. Come back for an update soon, though. Ciao! Please note: I realize the pictures are not the best quality, but my camera has broken on me. What a time for it to decide to break!